This is an excursion put on by the California-Nevada Railroad Historical Society on Memorial Day weekend, 1949. 450 railfans came over from California to ride on the V&T, and the railroad used every last car it had to hold them all. In front is Engine #26, and pulled behind it are flat cars with benches added, a box car, a tunnel car, a flanger, and the three passenger cars that were normally used in daily operation. All these cars were packed full of excursionists. 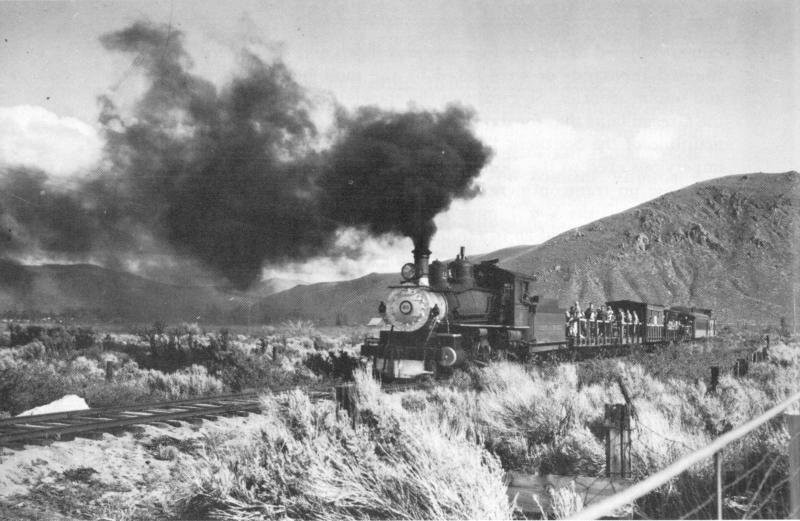 Here we see the train leaving Carson after a long day, heading back to Reno. You can see C Hill in the background as the train chugs north through the sagebrush. Today all of this is houses. Longview Way follows the old railbed.